A dry spring has meant a rampant wildfire season already for Australia. Hold those fires back? Arguably the largest volunteer fire department in the world. New South Wales uses volunteer fire services, even newly-elected Prime Minister Tony Abbott is a member. "The tragedy is that many of them have lost their own homes while they've been out saving those of others," says Kingston University academic Dr. Neil Thomas, an expert in environmental hazards. October 17th, 2013 was particularly bad. By 6:30 p.m. local time, 90 wildfires burned, 36 of them out of control and threatening communities near Sydney. Dry vegetation, 93° Fahrenheit temperatures and erratic winds gusting to almost 60 miles per hour combined to create extremely dangerous fire conditions. The Moderate Resolution Imaging Spectroradiometer (MODIS) on NASA’s Aqua satellite acquired this image at 2:50 p.m. (3:50 Universal Time) on October 17th. Fires are outlined in red; to the east, smoke pollution was a problem in populated coastal communities. The densest plume hangs directly over Sydney, though the brighter white streak is probably a cloud. 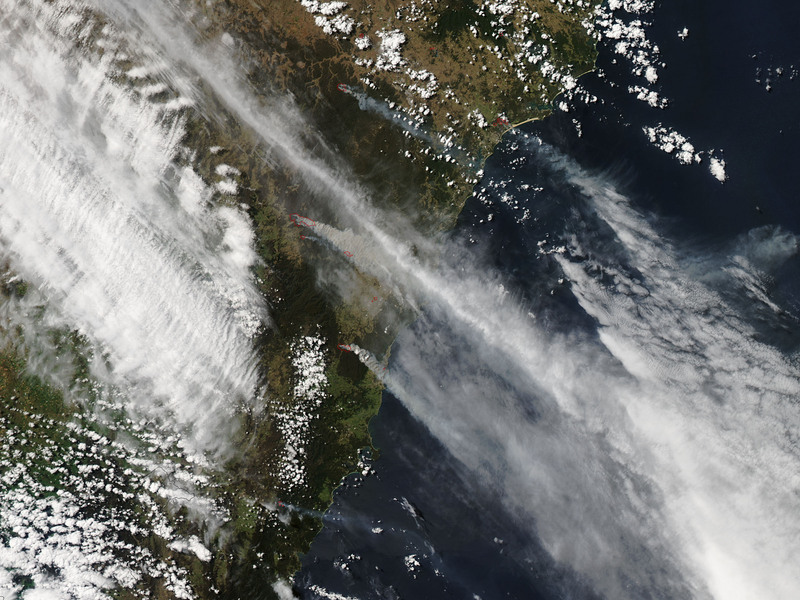 Fires outside Sydney. Credit: Jeff Schmaltz, LANCE/EOSDIS MODIS Rapid Response Team at NASA GSFC. Caption by Holli Riebeek. The largest fire shown is the State Mine fire, burning in the Blue Mountains near the Lithgow area, which has burned more than 20,000 hectares and damaged an unknown number of properties. To the southeast is the Linksview Road fire, burning near the community of Springwood. The third large fire is the Hall Road fire, which is larger but has caused little damage and is nearly under control. Those New South Wales firefighters have probably done all they could have done to tackle the bushfires - but nature is what it is at this point, argues Thomas, who has worked extensively with emergency response crews in the Australian region. No one can predict breakouts of extreme heat, other than saying 'we could have extreme heat' every year. "The weather in the past three weeks has been particularly bad - it's been very dry and windy and unseasonably hot. I've never seen the likes of it at this time of year in Sydney." California has similar problems, though for different reasons - Australia has too much wild land to manage while laws in California prevent responsible clearing - and exchanges of expertise and technology between the United States and Australia had allowed firefighters to manage the blazes as best they could. "The Blue Mountains are a tough enough place anyway, because they're so rugged and inaccessible, and once it becomes a crown fire - in the trees, off the ground - that's the most destructive type there is," he said. "It creates its own weather system and the heat and dynamic of the fire make it almost uncontrollable. The authorities almost have to just let it burn itself out and hope for rain." Events of such a magnitude at this time of year are rare, said. "We're not used to this at this time of year, it's usually nearer January or February. The winds usually come from the north west, but occasionally there's a southerly change which appears to have happened and cooled things down a bit. However, it's not lasted long - there's been a little rain, but not much. Looking at the Bureau of Meteorology forecast, it's going to get hot again. The firefighters will be hoping for the best but preparing for the worst."